Lakeland FL Events and Attractions - Things To Do Throughout The Year! Open all Saturdays from 8am-2pm and Wednesdays from 11am-2pm, the Downtown Farmer's Curb Market is a popular attraction in Lakeland for residents looking for organic fruits and vegetables, natural soaps, oils, and flowers, and a lot more locally grown or produced items. Customers are treated to live music on selected Saturdays, as well as festivals and activities. The Downtown Farmer's Curb Market is located on 200 N. Kentucky Ave., right across the Peterson Bldg. First Fridays in Lakeland are brimming with fun-filled activities and events for residents to enjoy. The Downtown Lakeland Partnership organizes the event and comes up with a variety of activities for the family such as live music, face painting, arts and crafts, and even a classic car show. After enjoying the activities in Munn Parl from 6pm-9pm, you could relax and unwind in dowtown shops and restaurants until late in the evening. Residents and visitors from all over the country flock to Lakeland during March of each year for the Strawberry Festival in Plant City. The main attraction is Parkesdale Farm's home grown strawberry and strawberry shortcakes. There's also live entertainment from famous celebrities and local artists, food, livestock, arts and crafts, and many more activities for the whole family to enjoy. Plant City is located down the street from Lakeland, just off Interstate 4. This week-long event makes Linder Airport in Lakeland the busiest airport in North America. Aviation enthusiasts from the entire country flock to the 850-acre footprint of the Lakeland Linder Airport. This event becomes a convergence of professional pilots, aviation students, airplane designers and builders, as well as those who dream of flying an airplane. This event is also called the Spring Break of pilots in America and throughout the world. The Major League Baseball's Detroit Tigers have held their spring training in Lakeland since 1934, which is the longest in Spring Training History. The Joker Marchant Stadium, which had been renovated in 2004 and seats 8,500, has been the venue for the games hosted by the Detroit Tigers since 1996. Gates open 2 hours before the first pitch. There is a mediterranean-style clubhouse down the right field where the players sign autographs for the fans in the box seats. This event is held every Mother's Day weekend across Lakeland's Public Library Lawn, commencing with the Mayfaire 5k classic race and ending with a spectacular fireworks display at 9pm. All around Lake Morton are artists with their crafts for sale or display including paintings, sculptures, jewelry, and much more. There is a kids zone for children to enjoy located in the parking lot of the Polk Museum of Art and art tent for children to bring out their imagination and creativity. There's plenty of food and live entertainment throughout the event. Free parking and shuttles are also available. 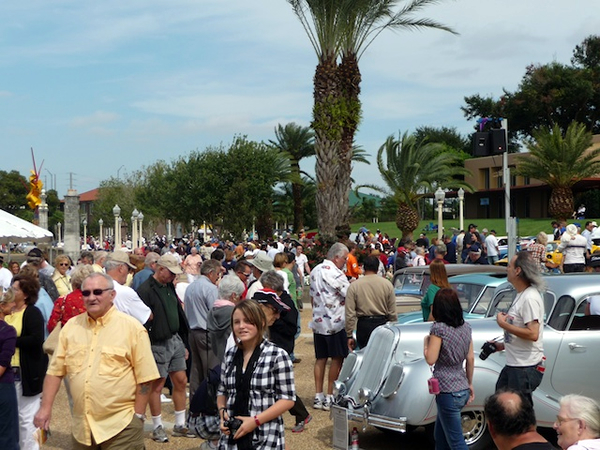 During October of each year, thousands of car collectors and enthusiasts flock to Lake Mirror in Downtown Lakeland for the Lake Mirror Classic Auto festival. Since 1999, the festival draws around 35,000 people from all over the nation to view and be mesmerized by about 600 vehicles. Aside from being a fun-filled event, this is also a fundraising activity for Lakeland's non-profit organizations such as the Junior Achievement, Boy Scouts, the First Tee, Historic Lakeland, and Lakeland Regional Cancer. Through the food and beverage sales during the event, more than $250,000 has been raised for these organizations. World class entertainment and shows await you at the Lakeland Center, with famous artists such as Phil Collins, Sarah Brightman, Michael Bolton, Merle Haggard, and Michael Flatley and his dancers. There are other entertaining acts for the entire family to enjoy such as Disney On Ice, the United States Air Force Band, and our local symphony orchestra. The Imperial Symphony Orchestra's concert series makes Lakeland Center a popular entertainment destination all year round.